Rolling resistance impacts on your car's petrol consumption: the lower the rolling resistance, the less petrol it uses. The highest grade in this category is indicated with the letter "A" in green, while a "G" in red indicates the worst score. The letter "D" means data not available. From A to G, every increment in letter means an increment in fuel consumption of 0.1 L every 100 KM. Wet grip refers to breaking distance on wet roads. Grades range from a green "A" to a red "G". At the moment, the letters "D" and "G" mean data not available. The levels are measured when a car is travelling at 80 Km/h. From "A" to "F" every increase in letter means a longer breaking distance. 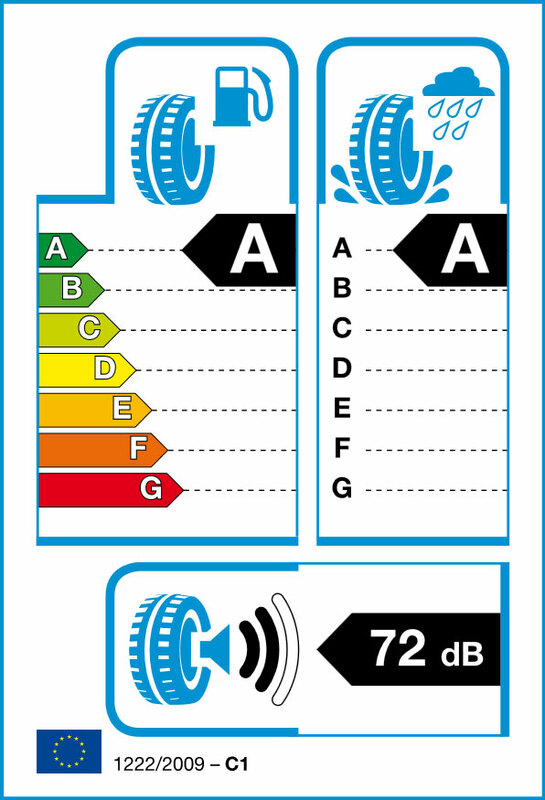 Noise levels indicate the tyre's external noise emission while in movement and is expressed in decibels. There are 3 performance levels represented by sound waves. The more black waves, the noisier the tyre. A constant exposure to sounds above 80 decibels can be bad for your health.